Antares at Wallops Island launch pad (Credits: Orbital Sciences Corporation). 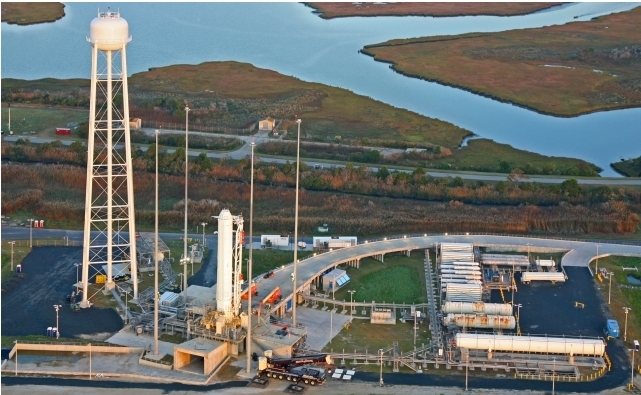 Orbital Sciences Corporation was all set to perform a hot fire test of its Antares rocket on February 13. The test is the last before Orbital launches its Cygnus cargo ship aboard the rocket on its demonstration mission to the International Space Station, making it the second commercial cargo ship to rendezvous with ISS, after SpaceX’s Dragon. But Orbital will have to wait a little longer now; Wednesday’s test aborted at T-1 second without firing. Although Orbital has not publicly speculated as to a cause, word is that a low reading on the Nitrogen purge gas line led to an automatic shutdown. The aborted test took places at NASA’s Wallops Island Flight Facility on Pad 0A. The test was intended to verify the pad’s fueling system, engine ignition and shutdown, and performance of the AJ26 engines. It follows just weeks after a successful wet rehearsal at the same facility in January. Orbital’s COTS schedule calls for a demonstration flight four to six weeks after a successful hot fire. Like the Dragon demonstration last year, the flight will involve rendezvousing with ISS and delivery of non-critical cargo. Provided the demonstration flight is successful, Orbital has a real cargo delivery slated for the fall. SpaceX made history in May 2012 when it became the first commercial craft to rendezvous with ISS. If all goes well, Cygnus will be the second commercial craft to claim that distinction. Unlike Dragon, Cygnus is not able to return supplies since it reenters Earth’s atmosphere destructively as do the Progress, HTV, and ATV supply vessels. Orbital Sciences is under contract to provide eight supply runs for NASA.